U.S. President Donald Trump speaks at a rally in Pensacola, Fla., Dec. 8, 2017. 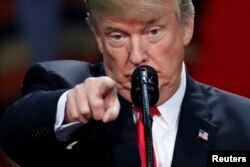 In his rally Friday night, President Donald Trump falsely stated that black homeownership has hit a record high under his stewardship and made the dubious claim that he set Canada’s prime minister straight on the state of trade between the two countries. Trump spoke in Pensacola, Florida, across the state line from Alabama. Trump looked back on his months in office and overstated his achievements during more than an hour of boasting. THE FACTS: Not true or even close. The U.S. Census finds that the black homeownership rate peaked during 2004, when 49.7 percent of black households owned homes (the rate for all races that year reached 69.2 percent, also a modern record). The black homeownership rate stayed in similar territory until the recession, when it dropped to the mid-40s. This year: 42.7 percent in the first quarter, 42.3 percent in the second and 42 percent in the third. That’s an uptick from last year but far from a record. Quarterly rates this year for the total U.S. population: 63.6 percent, 63.7 percent and 63.9 percent. THE FACTS: Trump’s first-year legislative record pales next to that of a variety of presidents (Franklin Roosevelt, with his New Deal, signed 14 historic laws in his first 100 days). The tax package Trump may soon sign would mark his first major legislative achievement after months of false starts and frustrations on health care and more. His promised infrastructure initiative got sidelined but appears in the offing. Trump signed a law strengthening accountability at the Veterans Affairs Department, used executive orders to roll back Obama-era regulations and policies and, perhaps most significantly, won confirmation of a conservative Supreme Court justice, Neil Gorsuch. But legislatively, his record is thin, despite having Republican majorities in Congress. All presidents sign plenty of bills that have little consequence; most don’t make so much of it. 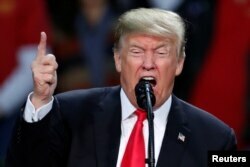 Among Trump’s routine signings: naming a Veterans Affairs health clinic in Butler County, Pennsylvania, after Bataan Death March survivor Abie Abraham, appointing a regent at the Smithsonian Institution, naming a federal building and courthouse in Nashville, Tennessee, after late Sen. Fred Thompson. 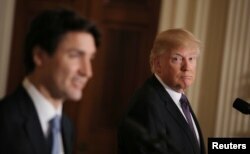 FILE - U.S. President Donald Trump listens to Canadian Prime Minister Justin Trudeau during a joint news conference at the White House in Washington, Feb. 13, 2017. THE FACTS: Trump’s accounting is puzzling and at odds with U.S. trade statistics. Trudeau is right that the U.S. has a trade surplus with Canada, according to those numbers. The U.S. ran a $12.1 billion deficit with Canada in trade on goods. That was offset by a $24.6 billion surplus in trade of services. Trump may have been ignoring services — half of the equation on trade — but if so his numbers still don’t match his government’s. President Donald Trump speaks during a rally in Pensacola, Fla., Dec. 8, 2017. THE FACTS: His win was far from a landslide. His winning margin in the Electoral College is far closer to the narrowest win in history than to the widest. The final Electoral College margin was Trump 306, Hillary Clinton 232, for a winning percentage of just less than 57 percent. That ranks the 2016 election as the 13th closest of the 58 presidential elections in U.S. history, according to a tally by Claremont McKenna College political scientist John Pitney. Barack Obama won both of his presidential elections with bigger Electoral College margins: 61 percent in 2008 and 62 percent in 2012. Trump’s margin was narrower than all but two of the last 10 presidential elections, those of George W. Bush in 2000 and 2004. As well, he lost the popular vote to Clinton. THE FACTS: According to the Federal Reserve, household wealth has risen by about $5 trillion since the end of last year, but that figure does include home values. Either way, stock ownership is highly concentrated in the United States, so a rising market is mostly benefiting a limited population. Ten percent of Americans owned 84 percent of the value of U.S. stocks in 2016, according to Edward Wolff, an economist at New York University. Median household wealth is still 34 percent below its 2007, prerecession level, Wolff calculates. U.S. President Donald Trump uses his famous "You're fired" line at a rally in Pensacola, Fla., Dec. 8, 2017. THE FACTS: Factories are not pouring into the country, according to available data. Spending on the construction of factories has dropped 14 percent over the past 12 months. There has been a steady decline in spending on factory construction since the middle of 2015, a trend Trump has yet to reverse despite his claims otherwise. The existing manufacturing sector, though, has been doing a steady dose of hiring. This appears to reflect the synchronized global growth that has aided a rebound in manufacturing after setbacks in 2016 from a stronger dollar and low energy prices. In November, manufacturing added 31,000 jobs for a gain of 189,000 from a year earlier. THE FACTS: It’s not true that wages haven’t gone up for 20 years. The latest jobs report shows average hourly earnings up 2.5 percent over the past 12 months, roughly the same pace of growth as the year before, when Barack Obama was president. Wages were rising faster in December 2016, up by 2.9 percent. Average hourly wage figures are volatile but they don’t show an upward trend under Trump. The last time unemployment was this low — in 2000 — that figure was rising at 4 percent. Inflation-adjusted median household incomes, meantime, have barely budged for several decades.